Editor’s Introduction: In this week’s Magic Oddica TheMisprintGuy tackles the infamous “Charlie Brown” misprints from Tempest, in which faint images of Charlie Brown can be seen in the background of certain Magic cards. Check out Chapter XVIII of Keith Adams‘ Magic Oddica to learn all about these unique collectibles! Many of us who have been playing for years now fondly remember playing Tempest, one of Magic’s strongest blocks ever created. There were many useful, powerful cards. But have you ever taken a good look at the set? No…a REALLY good look at the set? Seems there are a few things hiding on the Medallion cards. Somehow, images from comic strips ended up being printed on the Ruby, Emerald, and Sapphire Medallions. Many believe these images to be from the iconic Peanuts comic strip, as the Sapphire Medallion shows an image that is almost unmistakably Charlie Brown, with his gaping smile staring right at you. This is another one of those fantastic misprints, mostly because several of these are out there, and if you don’t know what you have, you’ll miss it. The images are slight, due to the fact that this is residual ink being printed on the card. Many of you who own one or more of these might not even know it. So let’s change that, shall we? Again, this affects the Green, Blue, and Red Medallions, and is in more than one language. 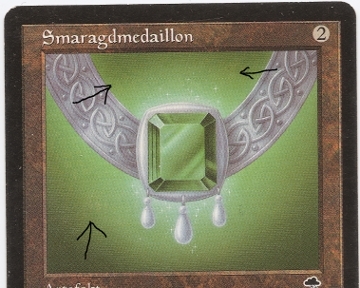 The error itself can be spotted by looking closely at the solid background coloring in the card’s artwork. I have provided images of each of these cards, with the best examples that I own, arrows to point out the faint images. 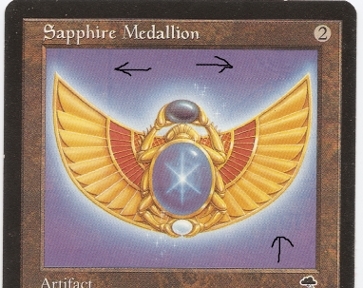 The Sapphire Medallion’s key image is the face seen in the top right. Better copies, like the one shown, will also have this random vertical line on the left, as well as what appears to be lettering on the bottom right. Emerald Medallions all show images of a face on the top center, as well as a female standing next to a jeep on the left. And the Ruby Medallion is much more basic, with what appears to be the corner of a box-like image to the left of the necklace. Interestingly, this is a mistake that Wizards has admitted making. 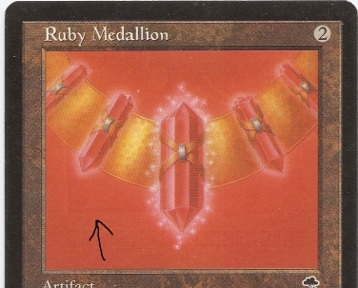 They show images of the Sapphire and Emerald, but they make no mention of the Ruby. Presumably, given how this mistake was made, there would potentially be trace images of this leftover ink on other Tempest cards printed at that time. However, it only the Medallions with these lighter, solid backgrounds that you can see these mistakes. I want to reiterate that many collectors and players simply don’t know of this misprint, making it somewhat likely that you may own a few and not know it. I always make a habit of inspecting every copy of these cards I see, and once and a while, I get lucky. Keep that in mind, and you’ll eventually find some yourself!